It's Facebook Fridays! for November 16, 2018, and now is the time to send dark work, ill wishes, hexes, and jinxes right back to where they came from! The Lucky Mojo Curio Company is holding a random drawing to give away 8 Reversing spiritual supply prizes to give your enemies and haters a taste of their own medicine. 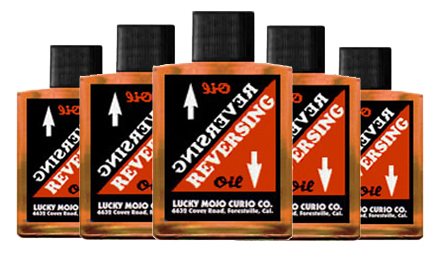 This week each lucky winner will receive a bottle of hand-made Lucky Mojo brand Reversing Oil for dressing candles, mirrors, or the doorknobs their hands will touch. 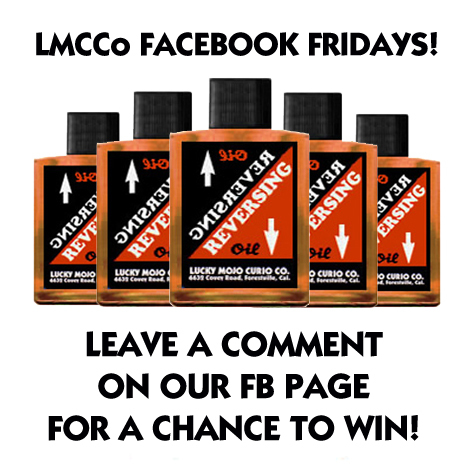 First thing tomorrow morning, we will select EIGHT winners at random, announce their names here, and ask them to message the Lucky Mojo Facebook Page with their mailing addresses, so we can send them their FREE Reversing Oil. Thanks for posting, Ernie. Venus goes direct and Mercury goes retrograde today, so this is a great product to distribute! We have a winner! In fact, we have 8 lucky winners! Our Facebook Fridays! winners for November 16, 2018 are: Heather McCool, John Orloff, David Craven, Debbie Samloff Ramirez, Dean Alfir, Latorra Hines, Steve Gustafson, and Patti Frabotta.